A mandatory update will remove three glitchy shortcuts from Mario Kart 7. Heh. "Backpedals." That was kind of clever. 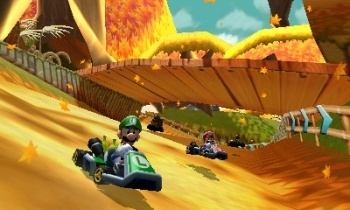 Back when it became apparent that unscrupulous players could use Mario Kart 7's dodgy respawn mechanics to circumvent vast portions of three of the game's tracks, Nintendo flat out refused to fix the issue, "as doing so would create an unfair advantage for the users of the original release of the game." Most speculated this was down to Nintendo's inability or refusal to allow to downloadable game patches for the 3DS. Nintendo finally got around to implementing a patch system for the handheld last month, and they've now announced a mandatory update that will remove the glitches from the online portion of Mario Kart 7. Filthy online cheaters will now find that the shortcuts on Wuhu Island Loop, Wuhu Mountain Loop and Bowser's Castle 1 no longer work. Players who attempt to play Mario Kart 7 online will be prompted to quit the game and download the latest patch, Ver 1.1, from the eShop. The patch won't affect the single player content, so you can cheat your robot friends out of victories until their tears rust their tiny robot hearts.